I would say in retrospect that I wish I had thought through the implications of a MIRVed world more thoughtfully in 1969 and 1970 than I did. In retrospect, I think if one could have avoided the development of MIRVs, which means also the testing of MIRVs by the Soviets, we would both be better off. Leaving MIRVs unconstrained, as William G. Hyland later wrote (Mortal Rivals, Superpower Relations from Nixon to Reagan, 1987), “was a truly fateful decision that changed strategic relations, and changed them to the detriment of American security.” Hyland served with distinction on the National Security Council staff and at the State Department during this period. He later became the editor of Foreign Affairs. By 1970 the United States had MIRVs ready for deployment whereas the Soviet Union had not even begun testing them. So the Americans did not exert themselves to discuss MIRVs during the SALT talks and definitely were not eager to ban them. In private talk Kissinger bantered with me, ‘Well, you are very smart indeed to suggest banning something you don’t have and we already do’… The American agreement to count MIRVs was then rather skillfully hidden under the cover of a condition which the Nixon administration (and Kissinger especially) knew Moscow could not accept: a link between a ban on MIRVed missiles and on-site inspections to verify the ban. Actually, the conditions the Nixon administration required for a MIRV ban were more onerous than Dobrynin recalled. They included on-site inspections of SAMs, constraints on SAM upgrades, and the dismantling of early warning radars. For the painful details, Gerard Smith’s Doubletalk is required reading. 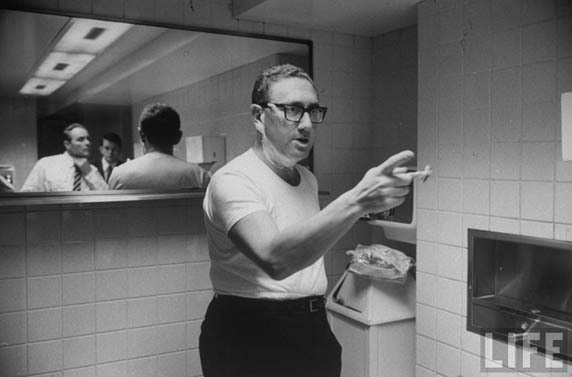 Kissinger clearly understood the consequences of MIRVing: he wrote a memo to President Nixon on July 13, 1970 laying out the prospective problem of ICBM vulnerability that would result once the Soviets followed the US down this path. But MIRVs, as Kissinger wrote, were a crucial counterweight to the 200-300 new ICBMs and SLBMs the Soviets were deploying annually. The Pentagon was “passionate” about MIRVs and lukewarm toward ballistic missile defenses. Okay so in 1970 the Soviets went to the US to discuss banning MIRV’s and we declined? Surely someone from the intelligence community must have communicated the specifications for what became the R-36. Surely Kissinger must have had it communicated to him that if the R-36 specifications were met, the Minuteman system could be attacked. And that the vulnerability of Minuteman would be augmented by the lack of Safeguard. They must have known what was in the works. Two things amaze me. 1 that the Soviets were willing to put the R-36 on the arms control table. What an opportunity missed. 2 I can only conclude that the US thought the USSR unable to bring the R-36 system as specified to operational status. Perhaps the Russian’s failure in their Moon program may have gotten to Kissinger’s and other American’s collective heads. For the broader consequences of an attack against Minuteman with SS-18s, see the fallout risk sections and maps in NAPB-90. Hint: “low fallout risk” was defined as a dose of less than 3,000 rem in the week after the attack. T.K. Jones didn’t think that was a problem, but I’m not so sure. Thoughtful exposition, but it was James Schlesinger who was SecDef in 1974; Rummy didn’t take the job for another year. And the only limit on MIRVs that Kissinger was seeking for SALT II at Vladivostok was constraining numbers of MIRVed missiles on both sides. So MIRVs could run if not so freely and I don’t think Schlesinger objected. Doesn’t Kissinger and the Nixon administration deserve credit for laying the groundwork for further negotiations with the Soviets? SALT I was imperfect, but what negotiations aren’t? The first step toward rebuilding one of the nation’s tactical nuclear weapons so it could be put in the stockpile well into the 21st century has been approved by House and Senate conferees. The lawmakers permitted $32.5 million to be spent next year on feasibility, design and cost studies for the non-nuclear components of the B61-12 tactical nuclear bomb, according to their report released this week on the fiscal 2010 Energy and Water Appropriations Bill. The measure contains funds for the nation’s nuclear weapons programs. The rebuilding of the bomb has raised caused some members of Congress and anti-nuclear activists to question whether a new nuclear weapon is being assembled.